Continuing upstream along the Stanislaus River we came to the New Camp Nine Road Bridge. The road was put in by Pacific Gas and Electric in 1906 to service the Stanislaus Powerhouse and the Town of Camp Nine. This bridge was a replacement for an older bridge that is a little upstream. 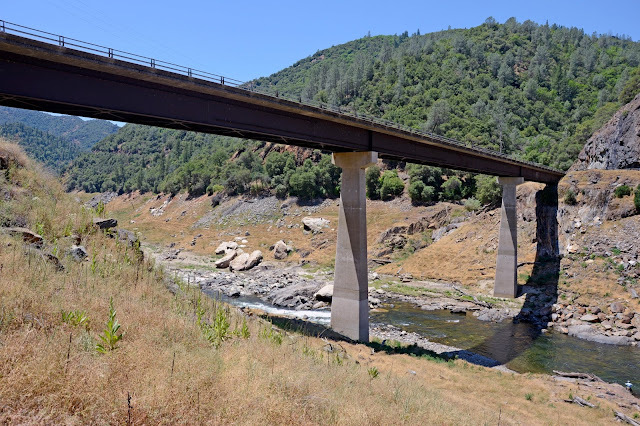 The New Camp Nine Road Bridge has tall concrete piers and continuous Corten steel girders carrying the road across the Stanislaus River. We'll take a closer look at this handsome bridge tomorrow. Calaveras County, California Bridges; New Camp Nine Road Bridge across the Stanislaus River (1) by Mark Yashinsky is licensed under a Creative Commons Attribution-NonCommercial-ShareAlike 3.0 United States License.